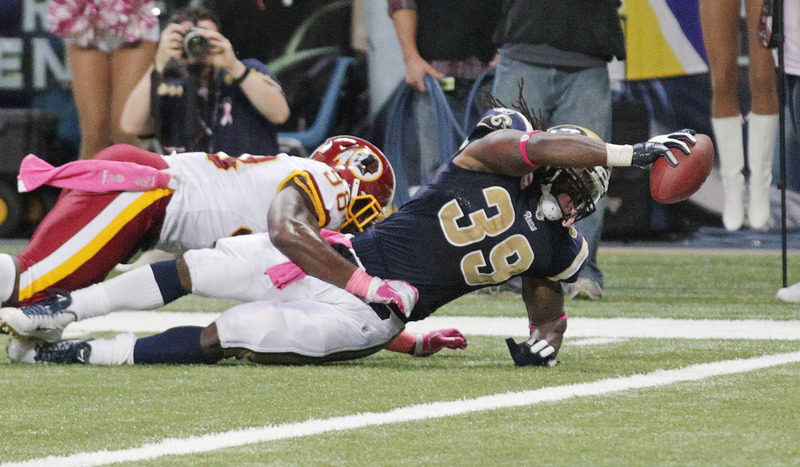 Steven Jackson scored on a 15-yard reception earlier in the fourth quarter for the Rams, who trailed 17-0 after three quarters, but their comeback is short in a 17-10 final, Sunday at the dome in St. Louis. The Rams have allowed 18 sacks on the year getting booed off the field. Brian Orakpo had 2.5 sacks, Stephen Bowen 1.5. Ryan Torain ran for 135 yards and a 20-yard score and Santana Moss scored on a 6-yard catch from Rex Grossman in the first quarter. Sam Bradford was 20-43 for 164 yards and a touchdown. Bradford also coughed up the football while being pressured. Jackson was held to just 45 yards rushing.